Coneflowers (Echinacea purpurea) can take up to two years to begin flowering when grown from seed, but once they begin blooming, they provide long-lasting flowering every summer. Coneflowers grow in U.S. Department of Agriculture plant hardiness zones 3 through 9. You can plant coneflowers during the spring, summer or early fall. It takes about six weeks for coneflowers to grow from seed to a transplant-ready seedling. You can start seeds indoors as early as six weeks before the last expected spring frost, but starting indoors in midsummer for fall transplanting also works well. Their roots don't tolerate disturbance, so sow the seeds 1/4 inch deep in individual peat pots. Peat pots don't require removal before transplanting because they decompose in the soil. Maintain soil temperatures between 65 and 70 degrees Fahrenheit during germination, and water the soil often enough so it remains moist without becoming soggy. Coneflower seeds germinate within 10 to 20 days, at which time they need full, all-day sun near a sunny window until you are ready to transplant them outdoors. Indoor-grown seedlings need transplanting when they are 6 weeks old and after all danger of spring frost has passed. When transplanting to a sunny, well-drained bed, dig the planting hole 1/2 inch deeper than the peat pot and make the hole twice as wide. Tear the rim from the pot and set it inside the planting hole so the top edge of the pot sits just beneath the soil surface. When filling in the hole, the rim must sit beneath the soil or it will wick moisture away from the coneflower. Water the newly planted seedling to settle the soil, and then water once or twice weekly so the soil remains evenly moist 6 inches deep. Conefloweres don't need fertilizer the first year you plant them. Coneflowers germinate readily when sown directly in the garden bed. Wait to plant until the soil temperature has warmed to 65 F in spring or early summer to ensure best germination. You can also sow outdoors later in the season, up to two months before the first expected fall frost. When planting coneflower seeds outdoors, choose a well-draining garden bed that's in full sun. Cover the seeds with 1/4 to 1/2 inch of soil, because they won't sprout if light reaches them. Thin the seedlings after germination so the plants are 12 to 18 inches apart in all directions. Wilting flowers give way to seeds, and coneflower self-sows readily if you allow it. 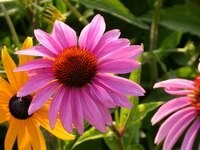 Deadheading, the process of removing spent blooms, throughout summer helps keep the coneflowers in bloom, but in late summer you can allow some flowers to set seed without suffering a major loss of flowering. Seeds that fall to the ground in late summer and early fall usually sprout the following spring and help fill in empty areas in the coneflower bed. Coneflowers can form seeds all summer, so remove all spent blooms as soon as they wilt if you don't want the coneflowers to self-sow.